Buy this 2 bedroom home & get 5 acres of land with a partially fenced yard, 2 fenced garden areas, 2 garden sheds, plus a 24' x 20' detached garage. 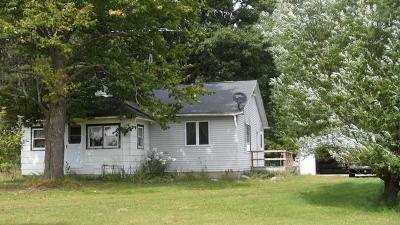 The home has a full basement with a wood stove that runs off the L.P. gas F/A furnace that is 2 yrs. old, a 7' x 16' 4-seasons front porch, 7' x 12' mud room, newer living room & 6' x 19' back wood deck. Re-finish the hardwood floors & with a little updating, you could call this home!